Private collection, Greenwich, CT, USA, until 2019. This characterful portrait of an unknown officer in Dutch armour was painted in 1656, the same year as Hanneman’s renowned self-portrait, now in the Rijksmuseum, Amsterdam. In near-pristine state of preservation, it is a rare example of the artist’s signed work of the period, and is painted with the confidence and assured brush-work for which Hanneman was much sought after. The sitter’s resplendent curls and gathered collar reveal a man of fashion, as well as action. His armour, carefully rendered with strong highlights across the breast-plate and to the visor of his helmet (just visible in his left hand), are typical of Hanneman’s Van Dyckian style. Adriaen Hanneman was born in The Hague, where he later became a pupil of the portraitist, Anthony van Ravesteyn. Around 1626 he moved to London, where it is possible that he worked for some time as an assistant in the workshop of Sir Anthony van Dyck, whose bravura and loose style he absorbed with alacrity. Around 1638 he returned to The Hague, where he joined the Guild of St. Luke and married his old master’s niece, Maria van Ravesteyn. The purchase of a house in fashionable Nobelstraat in The Hague in 1641 and an adjoining property in 1657 indicate that Hanneman prospered. He played a major role in establishing Van Dyck’s aristocratic Anglo-Flemish portrait style in The Hague. His patrons included members of the Princely House of Orange, as well as wealthy burghers and government officials. 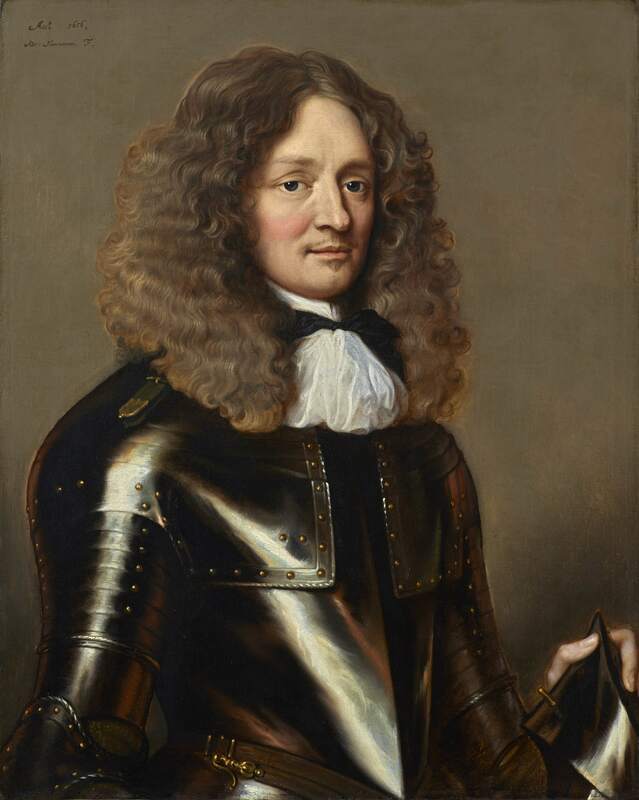 Due to the English Civil War, from the late 1640s onwards, large numbers of exiled British royalists began to settle in the Stadtholder court in The Hague, with Hanneman painting portraits of some of the key figures of the period, including Charles II, when still Prince of Wales, and Edward Hyde, 1st Earl of Clarendon (NPG, London).